In this 3rdinstallment of the type of fundamental analysis that professional analysts and investors conduct when making an assessment of company valuations, we will go through Comparable Transaction Analysis. Previously we broke down how to perform analysis a company on with a cash-flow model with our DCF article. As a follow-up, we explained how to derive a valuation of a company looking at its traded peers with our Comparable Company Analysis. Another way of assessing the valuation of a company that often comes handy when there is an active m&a market is comparable transaction analysis. Here we analyze previous transactions as a guide to assess the valuation of a company. Comparable Transaction Analysis has plenty of similarities with Comparable Company Analysis. The main difference is that in Comparable Transaction Analysis (also known as “Deal Comps”) instead of looking at what listed peer companies are trading at to discern potential value of our company, we look at what multiples actual previous transactions (acquisitions) have been conducted at. 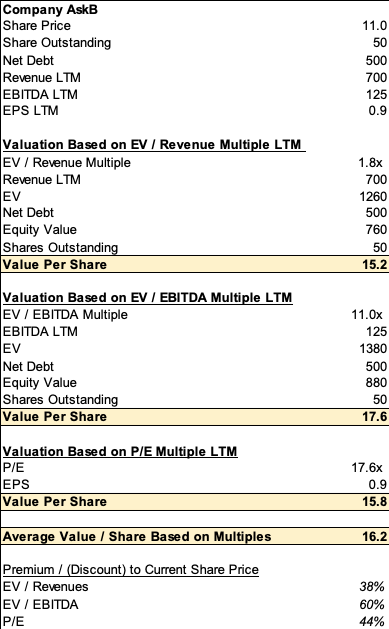 These include Enterprise Value / Sales, Enterprise Value / EBITDA and P/E. The differences lie in that in a “Deal Comp”, focus lies in what an actual acquirer paid for the company(in other words what a buyer actually thought the company was worth), instead of traded market value of that company. In a “Deal Comp,” the valuation includes a control premium which included while this is not the case trading multiples. This control premium often leads to that “Deal Comps” multiples are often higher than Comparable Company Analysis. If one looks at various announcements of deals, almost always the acquirer pays a premium to where the share price was trading prior to the announcement. As a yardstick, this premium tends to be around 30% above where the stock was trading prior to offer. Sometimes this premium could be even higher if the target company is in a super “hot” sector. Just like Comparable Company Analysis, there are several steps to go through to conduct a Deal Comp. We will go through them step by step. Public Tender and Merger Proxy Statements: When a company conducts an acquisition they often have to file a public document where they discuss the background of that specific deal. These documentations generally include previous deals the acquirer have looked into. A Schedule TO and Schedule 14D-9 is filed in connection with the tender offer. Basically, they have conducted a “Deal Comp” themselves that one can use as a base as an investor. 8-K: An 8-K must be filled by a public company when a significant event happens. Acquisition or disposals or anything of the likes is often considered material events and subsequently, 8-K are filled. It will include transaction details. SDC Database: Security Data Corporation database is probably the most extensive database which has deal information over 30 years back. One can search within the database both within industries, companies and time-periods. Unfortunately, this database is not free. If you study or work at a university, these institutions often have access to the database. Bloomberg, Capital IQ or Factset: These are additional databases that all have information historical transactions. Research Notes: If by chance you have access to equity research notes within an industry, the initiation reports for companies/industries tend to include details on previous deals. Google Search: Surprisingly, a good method to find information about deals and subsequent multiples is through Google search. Usually, when a deal gets announced, the deal value gets announced, in addition, details about multiples. In financial press articles, they oftentimes refer to older deals within the space and what multiples were paid. Or a reference to dates so one can conduct further research. In the end, this is a time-consuming process, generally with no exact numbers. As always, the best approach is to start at the SEC website as this an official regulator website were companies have to file documentation. This is a fairly start-forward premise. Finding deals within the same industry. Sometimes a company operates in several different industries, so one needs to include deal-comps from the industries it is active within. In essence, one wants to find company/deals which business is the most similar to the company we are trying to analyze and value. There almost will never be a “perfect comp”, but one can take into considerations different variables. These variables are same industry, same business size, same growth and margin dynamics. Also, similar capital structure and same geographic regions of operations are good parameters. All these factors will affect the potential transaction multiples. For example, a semiconductor deal in China might have a substantially higher multiple than deals conducted in the U.S. If the company we are analyzing is based in Europe, American comps would be better transactions to include in our analysis. Again, the best way to find these are in various proxy statements. In an m&a transaction, the fairness opinion section in a Form-4 filing has this information. We highly suggest that you look at these filings as they have an abundance of information. As a side-note, it very beneficial to become good at searching, and reading official statements from companies, let it be 10-K, 10-Q, S-4 or other statements as they all are not only free but include a wide array of useful information. LTM (Last Twelve Months) Financials for the target company. Please note, we went through all the calculations for Equity Value and Enterprise Value more in detail in Comparable Company Analysis. 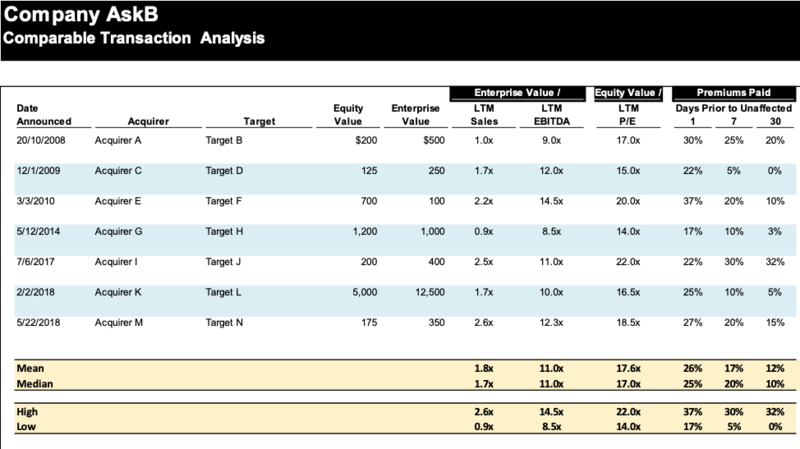 Another part of the Deal Comp analysis is to see how much premium a potential acquirer paid for a target. For example, assume you are analyzing a company in a hot industry with lots of m&a happening, beyond transaction multiples, paid, it gives a look at the premium paid for the acquisition. If the premium paid for the targets are substantial this would be a net positive for the valuation of the company we are analyzing. Below is the simple formula of how to calculate the Premium Paid. Usually, last trading price is the closing share price of the day prior to a deal announcement. It is not uncommon that deal rumours or leaks come out prior to the announcement of the acquisition. Hence often investors try to calculate the premium paid compared to trading price a week or 1 month ahead of the announcement of the deal. This way they can cleanse the premium paid for potential rumours or leaks. The output looks fairly similar to Comparable Company Analysis, with a couple of notable differences. Timing: It is important to note when the transaction occurred. For example, transactions that were far back in time might not be relevant for analyzing our company in today’s market. In our example, the first 3 deals, announced between 2008 and 2010 are probably not relevant when calculating multiples to use. As a rule of thumb, one wants to include the more recent the deal. Size: Assume our company AskB size is about $500m in equity value. The deal of which Acquirer I, bought target L, might be less relevant for our purposes as the target size L is $5,500m. This is more than 10x size of AskB. Capital Structure: The target company H in our example has net-cash (as can be seen where Enterprise Value is smaller than Equity Value). Assuming our company AskB has a lot of net debt, let’s say $500m. Its capital structure characteristics differ from target company H. Hence, we might put less weighting to that deal when conducting our analysis. For our example, with AskB we are going to use all the comps to get a better sense. In this example, AskB is currently trading at $11/share. Using the mean of the various previous acquisition multiples gives us a good parameter what AskB could be worth in a take-out. Here the average gives $16.2share (almost 50% premium). One thing this analysis shows is that the premium is higher if one uses EBITDA multiple instead of either Sales or P/E multiple. We can assess, what part of its cycle is AskB and what multiple would be the most relevant one. We previously went through when to use various multiples in our Comparable Company Analysis article. The same analysis and logic apply to Comparable Transaction Multiple Analysis. The positive aspects of a “Deal Comp” is that all valuations are based on public information. In addition, the valuations are based on what someone actually paid for businesses. This is quite important, and differs from DCF or Comparable Company Analysis. Here, with the comps’ it is what someone paid to buy a target. This information is useful in giving guidance what a buyer is will to pay for a targets in general. The analysis also gives a good understanding of what multiples are paid for different industries at different market times. Furthermore, the analysis gives a good indication of what types of transactions are trending. Who are the most frequent buyers are and what they are looking for. In addition, it gives a sense of general market demand for different types of assets. The negative aspects of this valuation methodology is that the public information available can be scares and sometime misleading. Previous transactions might have happened in a different market environment which taints the valuation. Also, previous transactions, could not be a good comparable. There might be deal dynamics that are company and situation specific. Finally, variables such as potential synergies, intangibles (such as patents), or other situation specific factors might taint the transaction multiples as a comparable. Comparable Transaction Analysis severs its best purpose to be used in situations where there is an active m&a market in the space one for the company one is analyzing. Again, just like our DCF analysisand Comparable Company Analysis, the valuation approach here is, as much art as science. Different industries focus on different multiples and results in different premiums paid. The comparable universe might sometimes not be perfect and the output results depend on the input companies we put in. Comparable Transaction Analysis valuation method should be used in conjugation with other valuation methods to get an as good holistic assessment of valuation.